ROME – Juventus fell just short against Real Madrid on Wednesday night, conceding a highly debatable penalty after an astonishing comeback. Gianluigi Buffon was sent off on his final Champions League appearance in a cruel goodbye as Cristiano Ronaldo’s 97th minute penalty clinched a dramatic 4-3 aggregate victory. Lightning threatened to strike twice as Juventus came within millimetres of recreating Tuesday’s scenes at the Stadio Olimpico. Mario Mandzukic got Juventus off to a blistering start, burying his header in the second minute to bring to tie back to life. A following chance for Gonzalo Higuain caught Madrid sleeping once again as the Argentinean forward could have easily doubled the scoring five minutes later. Madrid, however, did liven up as the dazed home side steadily came out of their shell. Gareth Bale went close and Isco had the ball in the back of the net, but was correctly ruled offside. Yet, it was Juventus who struck again; Stephan Lichtsteiner bought a yard of space off Marcelo and his cross found Mandzukic again at the far post. The Croatian striker did brilliantly as his header creeped inside the flapping Keylor Navas. One goal behind on aggregate, the tie was very much on. The second half quickly brought more luck for the Bianconeri. Blaise Matuidi raced into the box and was gifted his goal as Navas inexplicably spilt the ball at the midfielder’s feet, sending the away fans into delirium. With the comeback complete and the clock winding down, the game looked destined for extra time. Yet, on a night stacked up with improbability, it seemed the only certainty was a Ronaldo last-minute winner. The Portuguese star rose high above Alex Sandro, knocking his header down to Lucas Vazquez with the goal gaping. Medhi Benatia rushed in behind and was adjudged to have brought down the Spaniard by referee Michael Oliver as the Madrid midfielder tumbled over. 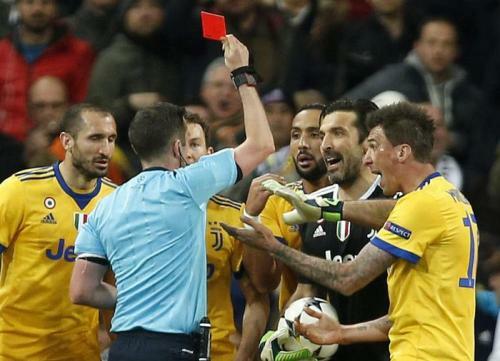 His decision will long be debated, potentially depriving Juventus of a deserved place in the semi-final, but the red card he showed to Buffon certainly appears rash as the Juventus players swamped the referee. The Italian legend was sent off for the first time in his Champions League career, receiving a standing ovation from the Madrid crowd, but it was a bitter ending for Buffon, unable to see out a fairy tale finish. Ronaldo, however, was unflustered by the drama. Having waited an age, the king of the Champions League shown nerves of steel to thunder in the 97th minute spot kick, sealing Madrid’s victory. A devastatingly painful outcome, drenched in anger and regret, but Juventus can only hold their heads high, taking pride from a dazzling spectacle at the Bernabeu.